Deep red jewels, sharp and woody bog plant cranberries, available everywhere during winter season. They remind me of CHANI BOR fruit, juju berries in English, similar taste and texture we used to get in India. 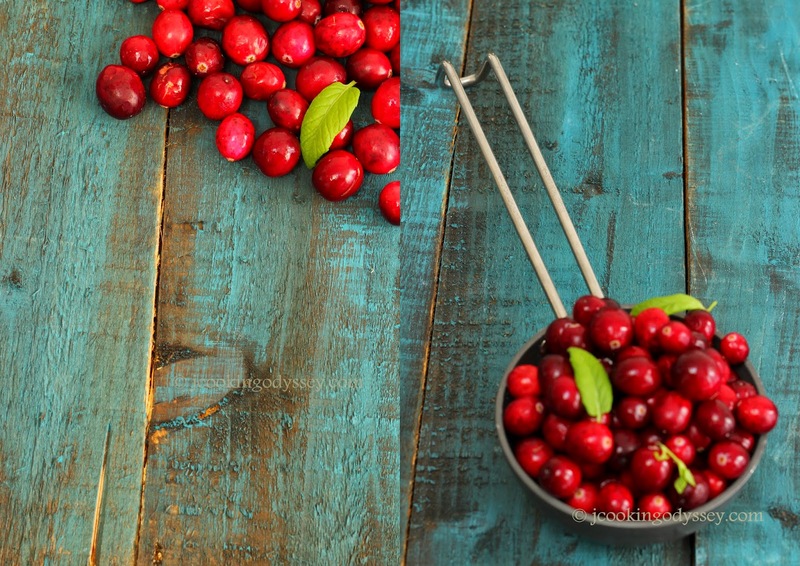 Cranberries are a winter berry that has become synonymous with the Christmas table for many in Britain. Their tart flavour lends itself well to both sweet and savoury dishes, as well as drinks. I nicked handful of cranberries from her and prepared this pickle, we are not a huge fan of pickles, like many Indians do, however fresh and instant ones are appreciated once in a while. I tried cranberry pickle, Indian version with extra kick and it came out totally different flavour but exciting ! In Gujarat, many households prepares BOR pickle which stays good up to one year, but I've never tried it. While I was preparing for pickle, daughter suggested that I should use Panch Phoran for the vaghar ( tempering ), she loves panch phoran, and I thought of including fresh haldi instead of using ginger as we didn't wanted over powering spicy pickle. In a jiffy we prepared the spicy cranberry pickle. The mild warmth of Chillies, Panch Phoran and achaar masala toned down the tartness of the pickle and spice it up a touch. Also a tiny bit of sweetness from the palm sugar, complemented the cranberries beautifully. Wash and thoroughly dry fresh cranberries and cut them into halves. wash fresh turmeric and chillies and cut into length wise . Mix cranberries, chillies, fresh turmeric, salt and achaar masala and leave it aside. Heat oil in a pan or kadai, add panch phoran mix and let it crackle, add hing. Now add cranberry mix into kadai and mix. Just cook for less than one minute, and add palm sugar paste and once again mix. Remove kadai from the stove. Let it cool completely and store in a air tight container. It will stay good up to 8-10 days in the fridge. This pickle is a perfect accompanied with any Indian meal.